Meaning arrives with a home version you can sink your ears into. If there ever were a perfect example of the importance of StoryReception, The Dark Knight Rises would beat it. Incomprehensible to the point of silliness in the theaters, the film features a remixed audio track for home release. Instead of wondering what the evil Bane said in practically every scene, we now get to enjoy his witty and piercing quips. As well as the entire point of the story. I originally wrote this film off regarding the presence of a complete story. As an avid fan of Christopher Nolan and his take on the Batman franchise, I approached the movie with great anticipation—only to be disappointed by what I felt was an inconsistent and at times, silly, conclusion. That was until I watched it at home. In the theater, I couldn’t understand what was being said at the time. And not only from the villain Bane (Tom Hardy)—which is to be expected. Without lips to help make sense of the dialogue, who could blame me? No, it was everyone. Bane included. Add to that a convoluted ticking time-bomb that conveniently appears during the latter half, and I got the sense that Nolan just wanted to get it over with quick. Oh. And I didn’t get why Wayne didn’t die at the end. It felt like a cheat—an emotional cheat to make everyone feel good. All this changed when I watched it at home. The Dark Knight Rises finally made sense to me. The Dramatica theory of story breaks the process of communication between Author and Audience into two significant parts: Storyforming and Storytelling. The Storyforming process is where the Author forms the message of their work. He determines inception points of conflict and crafts them in such a way to hold resonance with each other. This is where the meaning of the story finds its genesis. The Storytelling process is where the Author communicates that meaning to his Audience. The process itself breaks down into two parts. The first half, Storyweaving, finds the Author determining which scene comes first and how best to present each of them. This is the place where Christopher Nolan sits at the mixing board and decides how much he wants to garble Bane’s dialogue. It’s dangerous because the second phase of Storytelling—StoryReception—is the one place in modern storytelling where the Author finds little to no control. Mess up the Storyweaving (mixing), and you risk losing your Audience. And there’s not a single thing you can about it. At that point, the message of your story is out of your hands. Back in the caveman days, Ugg sat down by the fire at night and told stories. If what he said was unintelligible or misheard, Ugg could quickly and easily clear up any confusion. The advantage claimed by these ancient storytellers is obvious—they could make sure their stories were received correctly because they were present with every telling. Things have changed a bit. Not only do our stories find themselves accompanied by incredibly dramatic Hans Zimmer music, but they also see themselves broadcasted along infinitesimally small wires or through the air across the globe a couple thousand or a hundred thousand times a year. It’s absolutely impossible for today’s Author—even Christopher Nolan—to attend every screening. Modern StoryReception relies on elements beyond the Author’s grasp. Audio bitrates. Projection bulb amperage. Reclining seats. Even the snap of air-popped popcorn affects the Audience’s ability to receive the message of the story accurately. “I’ve always loved films that approach sound in an impressionistic way and that is an unusual approach for a mainstream blockbuster, but I feel it’s the right approach for this experiential film,” Christopher Nolan said, speaking for the first time in detail about the use of sound in his new film Interstellar [He was defending the soundtrack]. How can we possibly understand the point of a story, if we can’t even hear what is being said? He’s choosing himself over the city. Simple and in hindsight, obvious, I know—but I just didn’t get that the first time through the film. Conflict in Rises emanates from an imbalance of Equity. It’s peacetime, yet things are not fair. The 1% do not live in equity with the other 99, and that sense of justice motivates everything from Bane’s terrorist attacks to Talia’s attempt at revenge. Every single conflict experienced within the Overall Story Throughline of Rises finds its genesis in this narrative Element of Equity. Inequity, then, becomes the Solution. The injustice of Wayne’s sacrifice-of dying without anyone knowing his true identity—reignites the passion of Gotham’s citizens to take up the fight on their own. Matthew Modine’s Foley is the clearest example of this Solution in action. As is the climactic battle in the streets. But the most significant indication of this determining Element is Robin’s decision to quit the force. Can I change your mind about quitting the force? No. What you said about structures. About shackles. I can’t take it. The injustice. I mean…no one’s ever going to know who saved an entire city. He can’t stand the injustice—a clear-cut motivation that sets the stage for the next story. The Overall Story Solution of Inequity brings about a Story Outcome of Failure. At first glance, The Dark Knight Rises appears to be nothing less than a Success story. Wayne gets away free and clear, and the bad guys no longer terrorize Gotham. But the “bad guys” in this film were the Protagonists. The Protagonist of a narrative pursues while forcing others to consider. The Antagonist of a narrative avoids or prevents while forcing others to reconsider. Which one sounds like Talia and which one looks like Batman? Talia pursues a course of revenge, forcing the city of Gotham to consider the lies fostered upon them by their heroes. Wayne avoids confrontation, then turns to all-out prevention to save the city. He works to get Bane and Talia and most importantly, Selena, to reconsider their actions. Talia fails, thus a Story Outcome of Failure. With a failed Story Goal, the Story Consequences comes into play. Here, the Story Consequence of Conceptualizing is one last manipulation play by the likes of Gordon and the Batman—forcing the people of Gotham to re-conceptualize their city. Bruce Wayne begins The Dark Knight Rises in relative peace. Perhaps not as emotionally balanced as he could be, but enough of a balanced imbalance that he finds himself at to terms with his current situation as a wealthy recluse. This personal account of Equity as a Problem is what is needed to tie the Main Character Throughline of the film meaningfully into the Overall Story Throughline. This is why Main Character and Overall Story are even a thing: they give the Audience an opportunity to see a particular source of conflict both from within and without—something they can’t experience in their own lives. In peacetime, everyone grows soft. If you’re well off, then you don’t think there is a problem. You’re blind to what is really there. 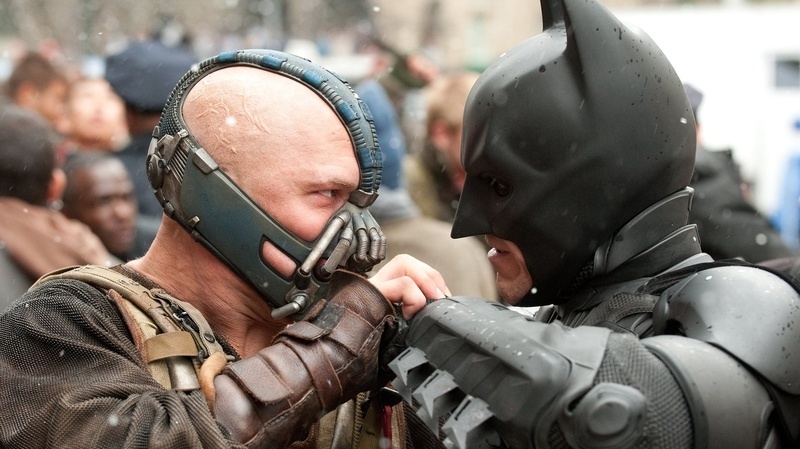 Batman moves at Bane - strikes powerful blows -Bane catches his fist. Peace has cost you strength. Victory has defeated you. Bane SMASHES Batman back - kicks him off the catwalk. With Wayne, we see his Problem of Equity reflected in his refusal to move on from the death of his girlfriend. His self-imposed punishment of living in exile cut off from the rest of the world, balances out the guilt he feels towards her untimely demise. As with the Overall Story, the Solution to Wayne’s personal problems is Inequity. Wayne chooses himself over the city. He chooses to live in Inequity with Gotham—and in doing so, finds the emotional relief he didn’t know he needed. Setting these key Storypoints into Dramatica’s Story Engine, we begin to synthesize the totality of Nolan’s approach. Robin, Alfred, and Selena work as a collective Influence Character Throughline perspective. This key component of narrative influences and challenges the Main Character to grow beyond his personal justifications. Robin’s recollections of the orphanage he grew up in finds similarity in Wayne’s own upbringing. Selena’s dubious attitude towards the rich and powerful challenge his sense of entitlement. And Alfred’s pledge and plea to continue the family line encourages Wayne to see that it takes more than balance to carry on. The Relationship Story Throughline perspective needed to complete the narrative incorporates aspects of that bond with Alfred—as well as touching on the contentious relationship between Wayne and Selena, Wayne and Robin, and even Wayne and Talia. Here, the emotional aspect of a shared peace runs between those who care about each other—and those who care about those they have lost. How it rises to the surface is quite another thing. Alfred’s revelation that Rachel wanted nothing to do with him strikes Wayne with a blow just as painful as Talia’s knife. Knowing that Talia possessed the inner strength to scale those walls—not Bane—drives home the truth of Batman’s birth in a tumultuous childhood that could never find peace. It frees Wayne up to stop fighting. Crafting a meaningful story is the Author’s prime responsibility. Delivering it in such a way that it can be clearly understood is a close second. Film is more than an experience. It’s more than a thrill ride. Film is a vehicle for meaning—a chance to lose our own sense of self so that we can appreciate how best to live our lives, without our own biases, and our own preconceptions getting in the way. Real life is noisy enough. Let’s protect the sanctuary that is a great story—and let’s make sure we are heard.